It’s savory, sweet, warm and a little bit crunchy – one of the stand out dishes at Thanksgiving, stuffing really is the ultimate comfort food. 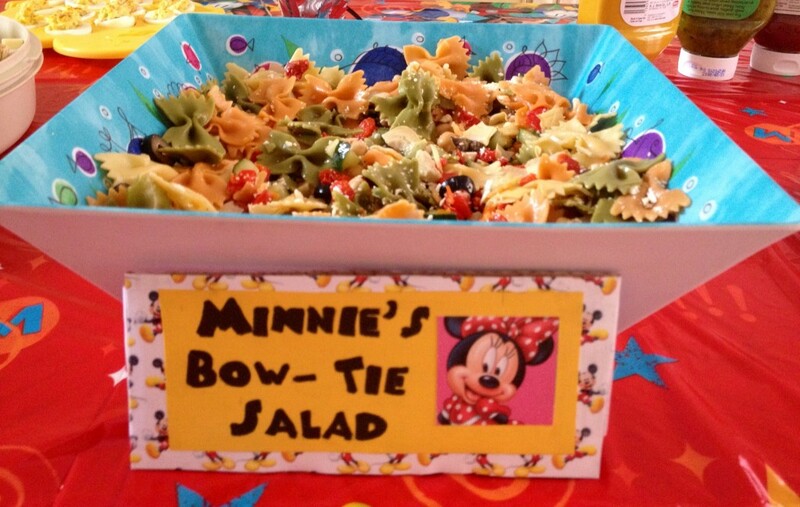 Whether you refer to it as stuffing or dressing, it’s delicious! 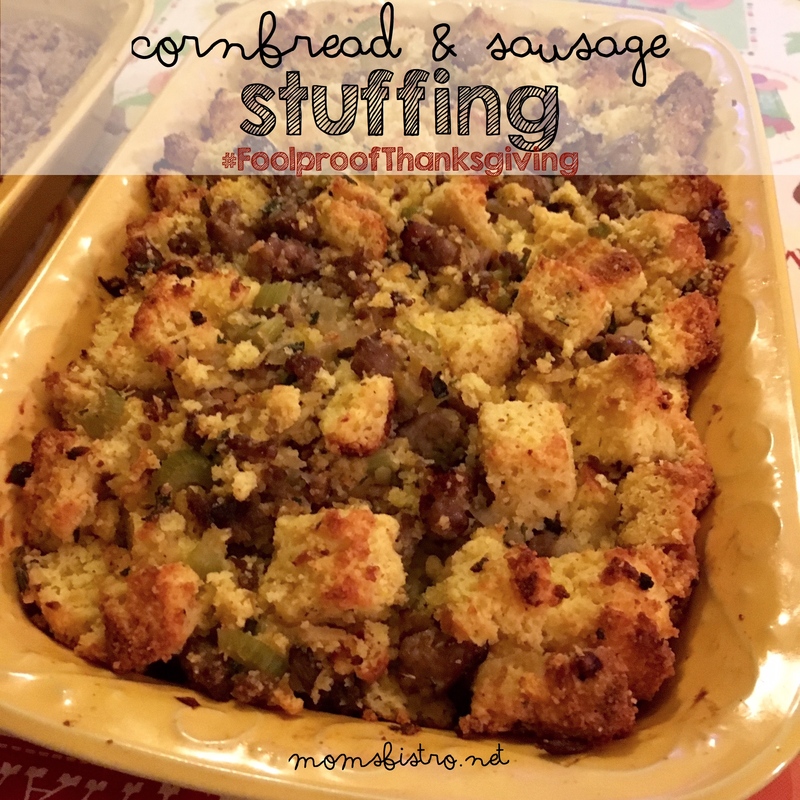 This Cornbread and Sausage Stuffing is full of flavor and super easy to make! 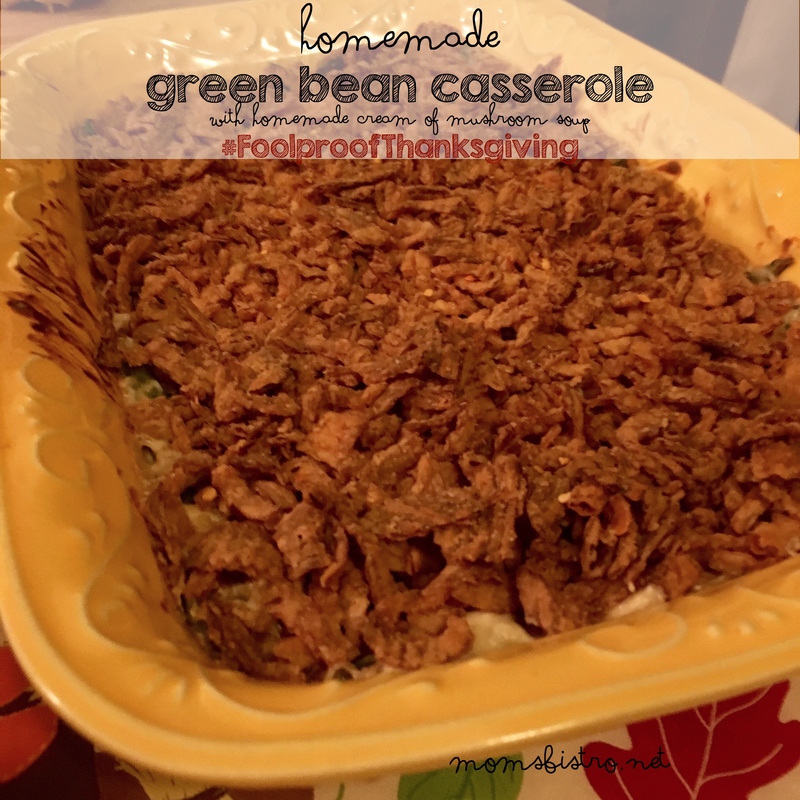 Best yet, it can be prepared ahead of time and makes for great Turkey Sandwich leftovers! Stuffing hasn’t always been my favorite Thanksgiving dish, until I tried it with cornbread. 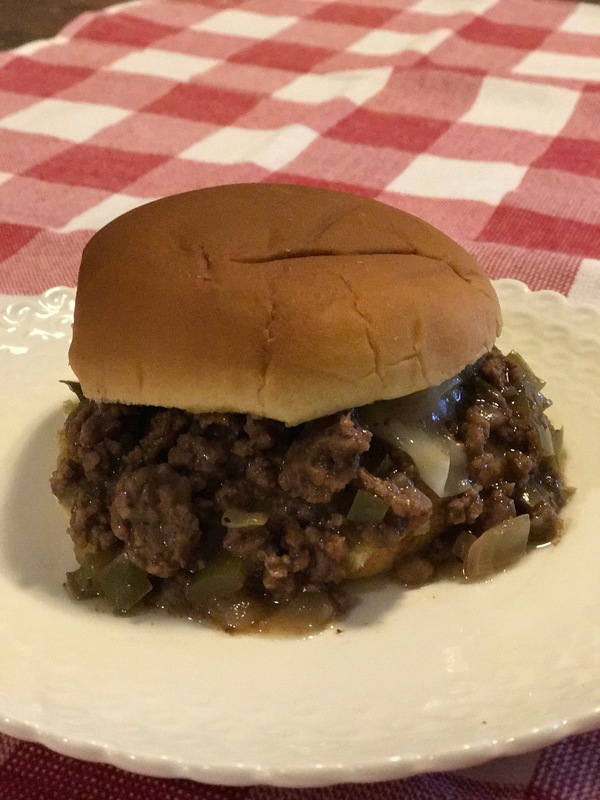 If you’re following my November Menu with the Thanksgiving Menu and Grocery List, this recipe is different than the recipe and groceries included in the list. 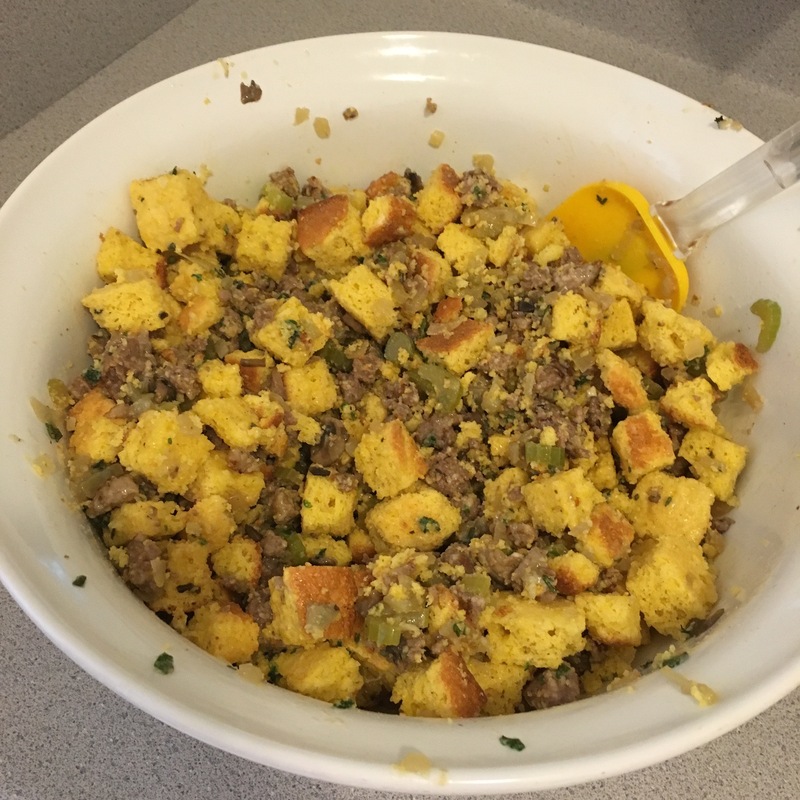 Substitute bread for jiffy cornbread mix and add some breakfast sausage, and you should have everything you need to make this scrumptious, Thanksgiving side. Stuffing is a great recipe to prepare ahead of time. About 3-4 days before you’re ready to serve your meal, cook the cornbread, let it cool and then cut it into cubes. Letting the bread dry out prevents soggy stuffing. 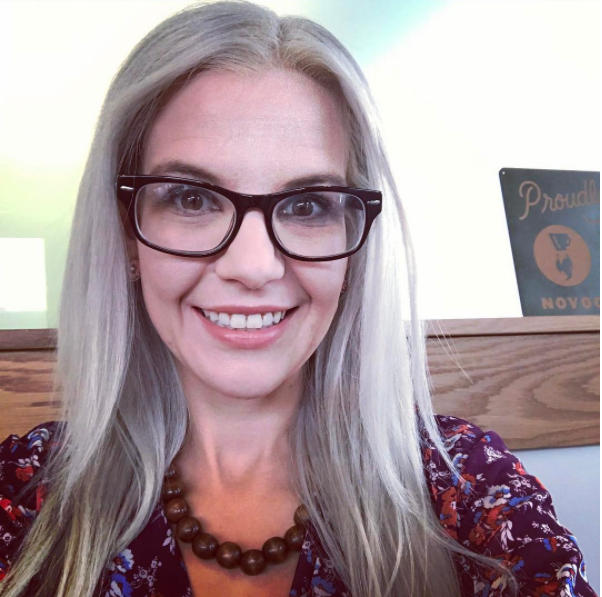 And then if you have the time, and space in your fridge, cook up the sausage and veggie mixture so that on Thanksgiving Day all you have to do is mix the cornbread, eggs and sausage then when you’re ready to bake pour over a little chicken stock. The recipe for this stuffing is to be baked in a casserole dish on the side instead of actually stuffing the bird. If you are going to stuff the bird with this stuffing mixture, make sure to secure the neck flap with a wooden or metal skewer and secure the legs with kitchen twine. Make sure that when baking the stuffing as well as the turkey reach an internal temperature of 165 degrees. We baked our stuffing in a casserole dish, but another fun way to cook Thanksgiving stuffing is to make muffins. 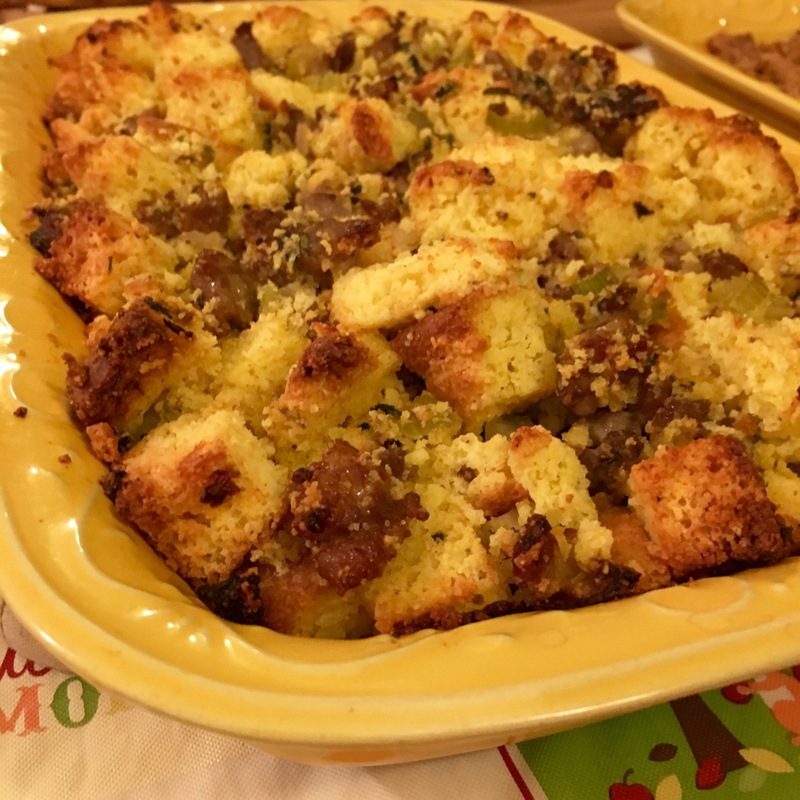 Prepare the recipe for Cornbread and Sausage Stuffing below, and instead of placing in a casserole dish, fill muffin tins with the stuffing mixture and bake. Toss the muffins in a basket like you would dinner rolls for a fun twist on Thanksgiving. 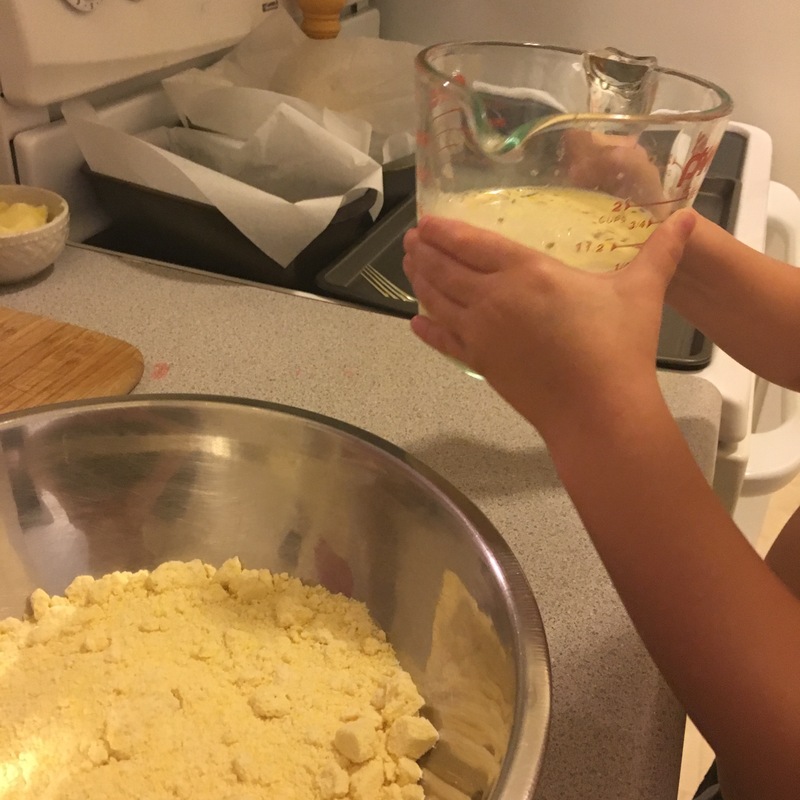 I had Anthony help me make the Jiffy cornbread. It made it a lot of fun, letting Anthony help cook up some of our Thanksgiving dinner. He was very proud of himself telling everyone at dinner that he helped! Cook jiffy according to package directions, let cool and cut into 1/2” pieces. 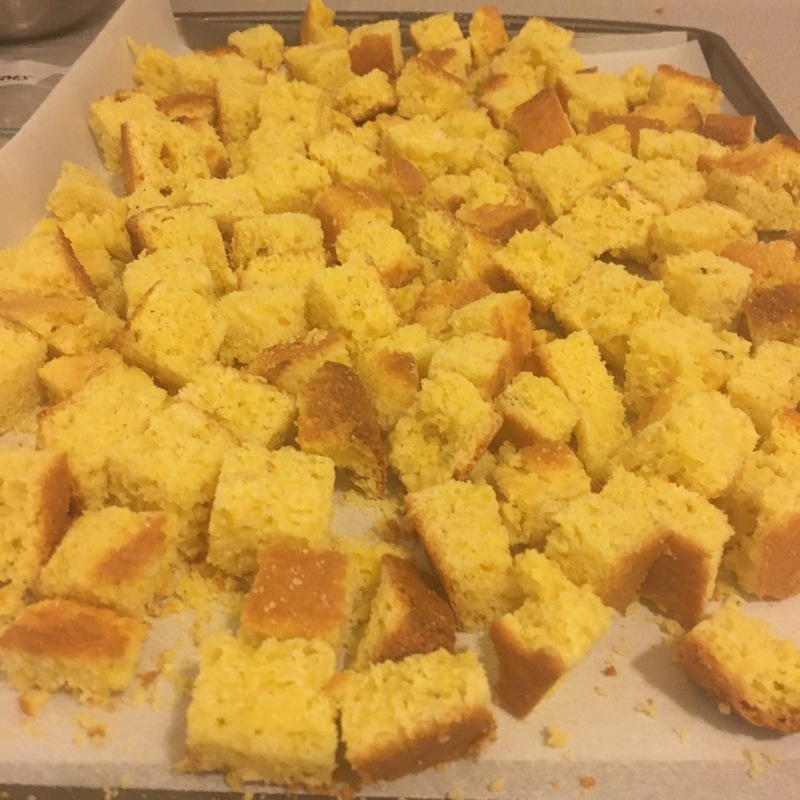 Place diced cornbread on a baking sheet, and let dry out at room temperature for 2-3 days. In a large pan over medium-high heat, cook sausage, breaking up any large pieces. Remove cooked sausage from pan, set aside and add veggies. Season veggies with salt and pepper and cook until onions and celery start to soften, and the onions turn translucent – about 10-15 minutes. 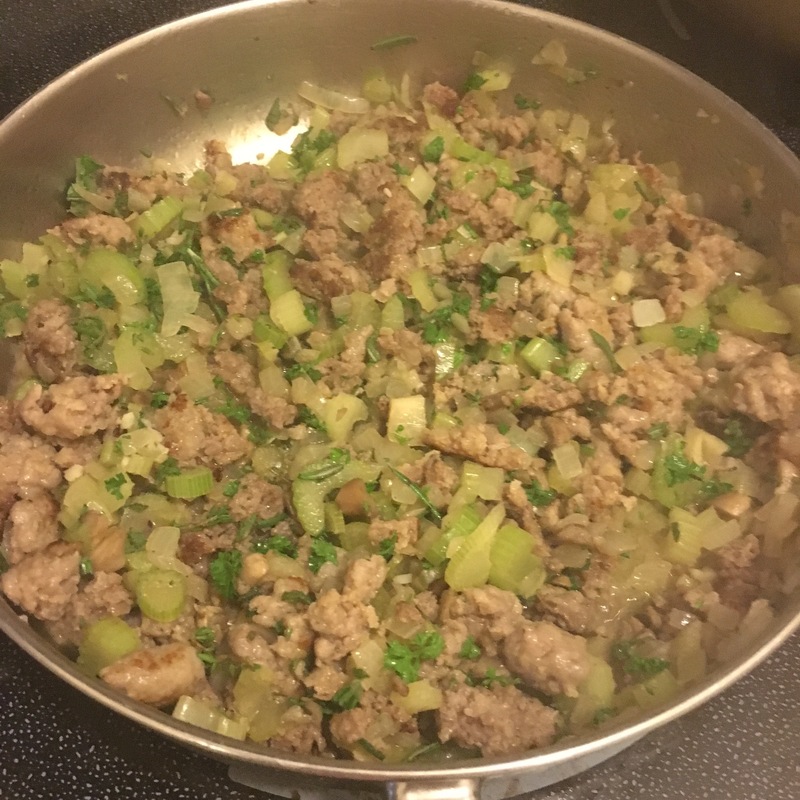 Reduce heat to low and add garlic and cooked sausage, stir until combined. Remove from heat and stir in fresh herbs and let cool to room temperature. Combine cooled sausage and veggie mixture with eggs and stir until well combined. 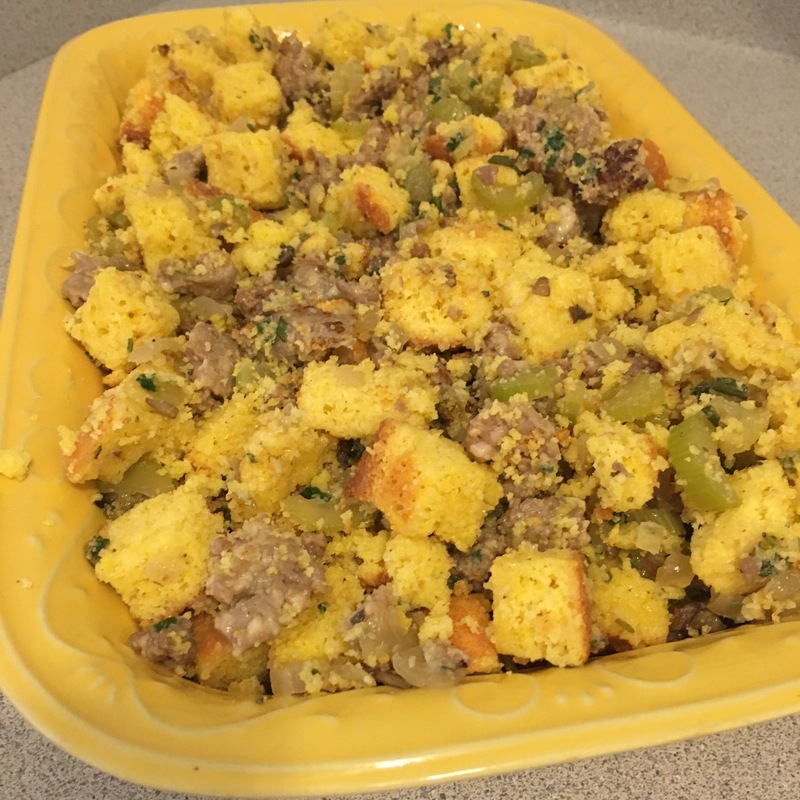 In a large bowl, mix dried out cornbread cubes and sausage mixture and stir until well combined. When ready to bake, evenly pour chicken broth over the top of the stuffing. 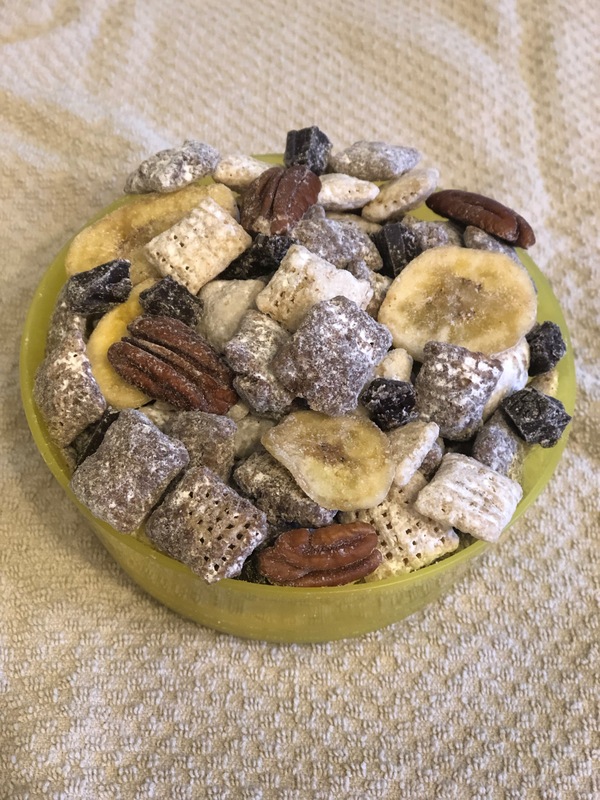 If you’re looking for the printable version of this recipe click the link below for a PDF version to add to your collection! Other easy Thanksgiving Recipes to make your Thanksgiving Foolproof!